On Tuesday 26th March sixteen boys, Joseph Bigley, Charlie Johnson, Alex Meadows, James Randall, Zac Richardson, Sulaimaan Ahmed, Raiden Swindells, Matthew Hannon, Junior Connor, Hugh Lawrence, Rajan Naidoo, Harry Wynne, Buckley Loftus, Raveen Mallawa, Hemanth Bheemireddy, and Methul Gamage, went to Crosby Library for the Sefton Super Reads award afternoon. Pupils from several local schools gathered to hear two of the shortlisted writers, Ele Fountain, author of Boy 87, and Sylvia Bishop, author of The Secret of the Night Train, talk about the inspiration for their writing, and the background to the books. Boy 87 was written in Addis Ababa, where Ele and her family had moved. Some of the characters were based on the Ethiopian women she had met there. As she had been a publisher’s editor before she wrote her own novel, Ele decided to use a pseudonym so she was unknown to publishers, who accepted her book on its own merits. Ele’s favourite authors include Philip Reeve and Patrick Ness, while Sylvia loves John Steinbeck. As Sylvia loves to do research, she made the train journey from Paris to Istanbul, before using it in her book. She is now working on a novel about smugglers in the eighteenth century, researching in the National Maritime Museum and its library. Pupils asked some very perceptive and searching questions, before the winners of the book review competition were announced. Rajan Naidoo won a prize for his review of Charlie and Me by Mark Lowery. 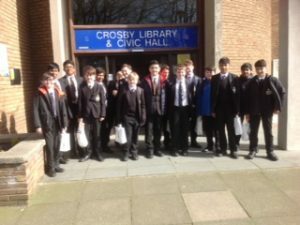 The winner of Sefton Super Reads 2019 was Boy 87, the first award Ele has ever won. She said she was especially delighted, as this award is decided by the votes of children.